I’ve had a desire to learn to work with Raspberry Pi since, like, forever. What better way to learn it than by trying out some DIY project? 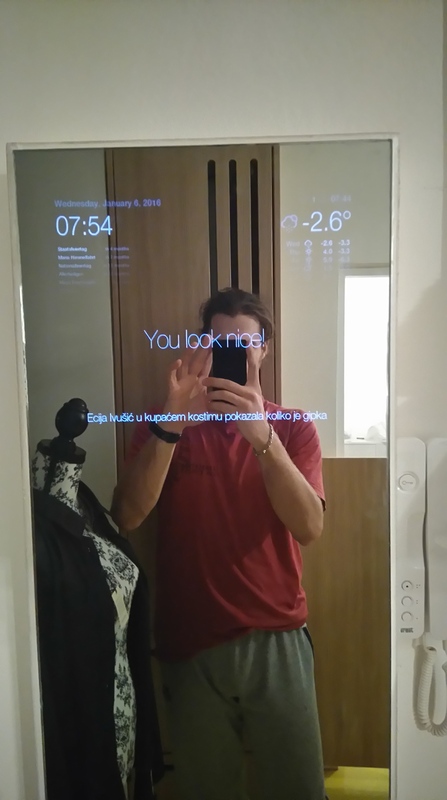 One of the most popular ones I’ve found around is brilliant Magic Mirror by Michael Teeuw: it’s a mirror that displays some useful info (in.e. time, forecast, news etc.) in a very stylish-looking way and gives your home a classy appeal. The only issue I had with it is that it is always on, even when there is noone around – which can be quite troublesome for your electricity bill. That’s why I decided to incorporate a simple motion detector to turn the mirror on and off, depending on whether there is somebody in the house. 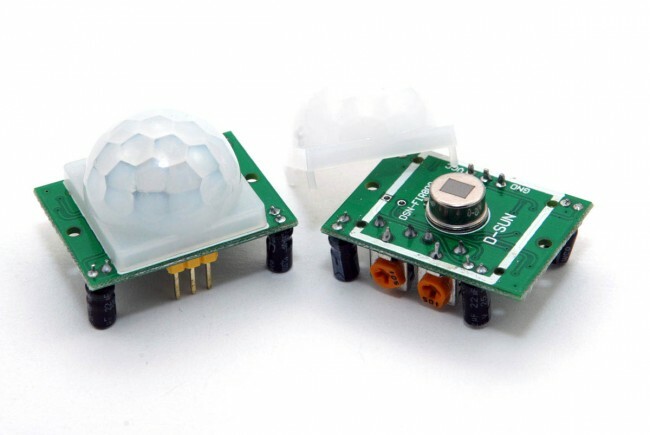 PIR motion sensor, like one of these. The Magic Mirror software is basically a web-browser displaying a delightfully designed php page on a local server running on R Pi. Here comes the fast run-through on how to set up Michael’s mirror. Set up a Raspbian (Jessie) on your R Pi, enable SSH, WiFi auto connect, and boot in Desktop mode (may the Google be with you). Download Michael’s code from github repository into /var/www/html folder (sudo git clone https://github.com/MichMich/MagicMirror). 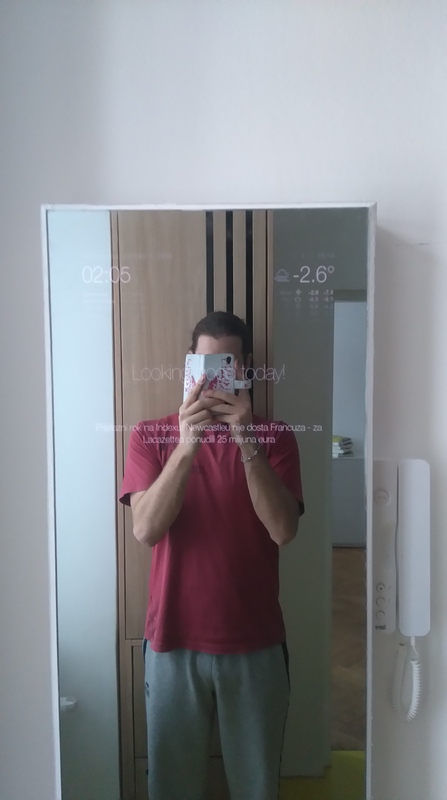 At this point, you might check the website he made by opening http://”R Pi IP”/MagicMirror. Looks neat, isn’t it? 'q':'Baarn,Netherlands' to 'q':'<city>,<state>' to city and country where you live. that will ensure that R Pi opens a Midori browser on your homepage in fullscreen mode right after it boots up. This is so called kiosk mode. It will also disable the screen going off eventually. You can also disable the cursor showing in the middle of your screen by installing unclutter (sudo apt-get install unclutter). If needed, you can rotate your screen (if you use it in vertical mode) by adding "DISPLAY_ROTATE=1" in /boot/config.txt (I didn’t need it). At this point you should have the R Pi running the Michael’s code with your private settings. Well done! There are many options of motion detection, and the most popular one is arguably a PIR sensor which is basically an IR sensitive JFET. So it senses your body heat when you move around. It usually comes on a board with a regulation circuitry, BISS0001 motion detector IC, and plastic cap that focuses the radiation. It has only one output pin that is logic high (3.3V) when the motion is detected and low (0 V) otherwise. Adafruit has a pretty helpful tutorial on these thingies. The script basically reads the sensor state from the 7th GPIO pin and depending on its state and the time since the last activity it turns on or off the monitors. Now, this is an interesting part: monitor is turned on/off by calling a shell scripts monitor_on.sh and monitor_off.sh. Each of these contains simple tvservice command and everything would be easy-peasy if there wasn’t that HDMI/VGA babble. More on that a bit later. When I tested the PIR sensor for the first time it worked like a charm. 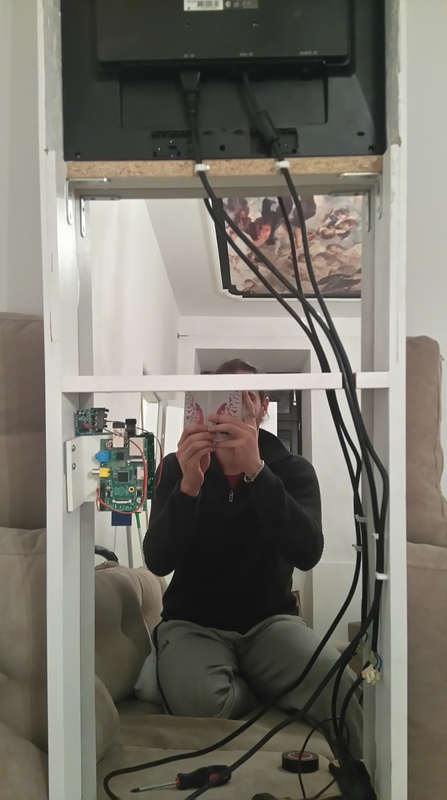 But when I built it in a mirror there was a problem – a sensor output was always in high state! I’ve lost a lots of nerves trying to find what was the reason for malfunction. At some point I noticed that sensor works normally again when the WiFi dongle is switched off. I realized that the cables connecting sensor with the Pi are picking up some WiFi interference as they are placed quite close to the dongle. The cables behave like some freaking antennas! Aaargh! How to solve it then? One convenient way is a ferrite bead – a ring of ferritic material around the cable that absorbs most of the high-frequency radiation. Where to find one? It’s Sunday afternoon, ferrite bead stores are all closed. Look around the house, find a smartphone charging cable…what’s that bump next to the connector (that cylindrical widening on the cable)? Cut it out, strip it off, OMG it’s a ferrite bead!! Woohoo! Put my cable through it, just like on the photo on the right, and what – interference is gone and sensor is read normally again! If it doesn’t work try: multiple windings around the bead, different material type or maybe some ceramic capacitors to the ground next to the connectors. Back to turning the monitor on and off. So, the Pi has a HDMI port while the monitor I got has a VGA. In normal operation HDMI-to-VGA adapter would be enough, but here we need to take a special care on few things. First, open the /boot/config.txt and edit few things, like set hdmi_force_unplug=1 that will force the HDMI output on R Pi even though there is no HDMI device on the other end. You may want to change few other options to define desired resolution or audio output. Other cool HDMI settings are listed here and don’t forget to set the resolution (hdmi_mode) that your monitor supports. Seems I need to learn a little more about the OS. I have been able to figure most of this out without any prior knowledge but I keep trying to do things the Windows way. Essentially I’m just going into the file manager, opening the files and trying to edit them. Thanks for the writeup! 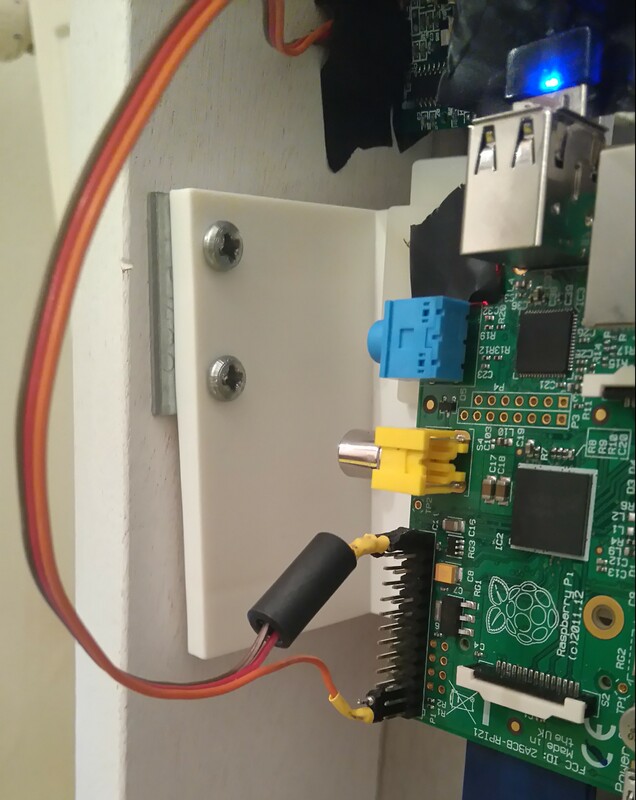 Could you please tell me where exactly you bought the PIR sensor from and what did you use to connect the wires from the sensor to the pi? Definitely, I bought them on ebay,can’t find the link now, though Adafruit sells them also and probably has a better customer service. I connected it via simple 3-wire strip cable, soldered on 100mil header, really nothing special. Here is what I did, everything works except for my google calendar. hey, I’m not actually familiar with js nor php so I might not give you a very helpful answer but so far I see it putting an url of your iCal config.js line 38 should be enough. I don’t think that changing calender.php is good. Try it out and please let me know if you manage to fix it. Hello there thanks for the guide post! I plan on following this post to make a similar mirror as a gift. I have two questions wondering if you can answer them. 1. What was the thickness of the two mirror that you used? 2. I am assuming that you monitor is shorter than the length of the mirror. When the monitor is on, can you even notice that the monitor is shorter than the mirror such as some outline or anything? 2. Well, if you take a really deep deep view you can see edges of monitor reflecting light, but in normal mode it’s invisible, just as you can see on the photos. Yes I could not tell from the pictures at all. What was the size of the monitor that you ended up using? 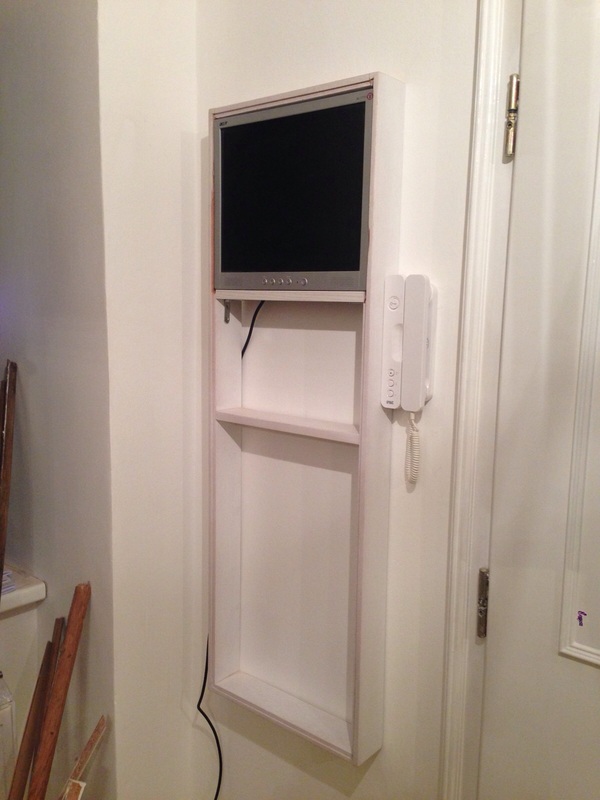 I was thinking of using at 27″ inch monitor but may go with at 22″-24″ to save money. Thanks for the write-up one of the best interfaces i’ve seen on a Magic Mirror. It seems that Holiday api isn’t working on my setup. Am I missing something? Also, have you ever thought about potting a weather map on the mirror as weel? Great tutorial! Could you please tell us where did you find the mirror? In a small glass workshop in my hometown, and they do not have a website or something to make them more accessible. If you live in Vienna, Austria, I could provide you their address. It was still expensive, about 114€ for that matter. I got everything beside a frame. Did you order the frame or did you made it yourself ? Danke! Thats fine. So I will first go and ask a carpenter for the frame maybe even with notches (de: Nuten). If this this is to expensive I will try find a L-Shaped piece of wood and hold the mirror like you with some icon pieces. I really want to try to make it as thin as possible, about 5cm depth. Pero, could you please take a look at this forum where we build smart mirrors? I am also having issues getting my monitor to wake back up and look normal. When using the command “sudo tvservice -p” monitor wakes but no image. When using “sudo tvservice -p && fbset -depth 8 && fbset -depth 16” the monitor wakes up and I see an image but resolution and colors are all messed up. I have a straight HDMI cable from PI to monitor and my monitor EDID is being reported as 1920 x 1080 @6oHz. Wondering if the fbset depth of 8 & 16 need to be different values based on my monitor’ resolution…but so far unsuccessful in figuring out. Any suggestions? Hi and thank you for that perfect instructions. Everything works fine up to now. I got two examples of different glas which I just testet. I also tested the PIR sensor behind the glas and it did not work. Without glas everything works perfekt, with the glas the PIR does not recognize the motion anymore… And when I look at your pictures, it looks like the PIR senses trough the glas. Is that correct? Did you do any “trick” that it works? Hello Michael, thanks for writing. Nope, there was no trick, though I had some troubles with the PIR working behind the mirror in the beginning. I thought that glass IR absorption was too high so I tried to play with potentiometer to adjust sensitivity and pulse width. In the end I made it “satisfyingly” enough, though it does not respond very fast all the time. If you find some other solution, please keep me updated. where did you place the PIR-Sensor? I tried it myself and it doesn’t work behind the mirror. Hello Lars, thanks for writing. As I said to Michael just above, I had some troubles with the PIR working behind the mirror in the beginning. I thought that glass IR absorption was too high so I tried to play with potentiometer to adjust sensitivity and pulse width. In the end I made it “satisfyingly” enough, though it does not respond very fast all the time. If you find some other solution, please keep me updated. Added the motion detect based on this post. Thank you! I couldn’t get the PIR to work behind the glass, so I mounted it on top. Looks ok – also added the Alexa Voice service, so now I have a talking mirror. 🙂 I also played with replacing the news headlines on the bottom with family photos, but it was too dark to be practical. your mileage may vary. Hello JP, this sounds great! I’d be happy to see it, if you have posted it somewhere online. I wish you a lots of luck! I see no reason why not – there surely are some WiFi apps you can make that enable communication between your smartphone and R Pi, though I’m not familiar with them. Thank you for the blog entry. I am trying to add PIR to switch on/off the monitor. I have a PI1. Can you please show the connection details. which pin on PIR connects to which one on GPIO. and what ever the rest of hte steps are. There you go: https://www.raspberrypi.org/learning/parent-detector/worksheet/, here’s a very nice info you need to get started with PIR. Considering the discussion on the location of the PIR sensor above, it would be helpful if you could share the tickness and material (glass or acrylate) of your mirror. Considering the significant absorption of IR radiation, thinner is better and it will help others to get a PIR behind the mirror working. Many thanks in advance! Anyone have any problems? Considering if I need to mount the PIR outside of the wood frame. I know this post is old, but how much would something like this cost to build, roughly? hey, i remember exactly: mirror itself 190€, frame 50€ but the woodmaker was friend, Rpi and peripherals cca 50€. My material cost were 271 €. Hi, is a curved magic mirror display possible?